A few weeks back whilst at a local supermarket, I happened to bump into a friend of mine whom I have not seen for years. However we do keep in contact through Facebook. That's the best thing about social networking sites because you are in touch with people you know without having to be physically in the same place at the same time. But then again there's the downside about it - everyone seems to know what you are up to and there is no where to hide! My friend's eight year old daughter had been bugging her for a pet dog and the standard reply has always been "no, you can't have one because your baby brother is on the way". My friend is currently pregnant with her third child. Later that evening I received a text message from my friend asking if she could bring her daughter over to my place on the weekend to help me bath my two dogs. Her mother thought it would be a good idea for her to learn how much work goes into taking care of pets. Plus hopefully this fantasy goes away. Mind you, keeping a pet is not easy. Your pets are for life and I truly believe this! Pets are not to be bought on an impulse, just because they are cute and then when the novelty wears off, they are discarded or abandoned. In Singapore, this is happening so often and the shelters are always full. I told my friend sure, come over for tea as well, and I’ll bake some treats. I think her little girl had fun that afternoon and I know my two dogs did as well. 1) Place the sugar, cornflour, cold water and finely grated zest in a medium-sized saucepan. 2) Over a gentle flame heat the curd, stirring continuously until it begins to thicken. 3) Add the beaten eggs and butter and continue to heat and stir through until very thick. 4) Remove from the heat and add the lemon juice, adding more to taste as desired. 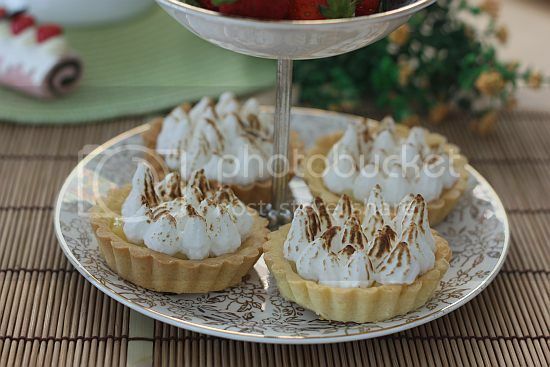 Pour the lemon curd into the cooled cooked pastry shell and top with the meringue. 1) In a very clean and large bowl or the bowl of a stand mixer place the 4 egg whites. Whisk until soft peaks form and then gradually add in the sugar a little at a time until the meringue is thick, smooth and glossy and all of the sugar has dissolved. 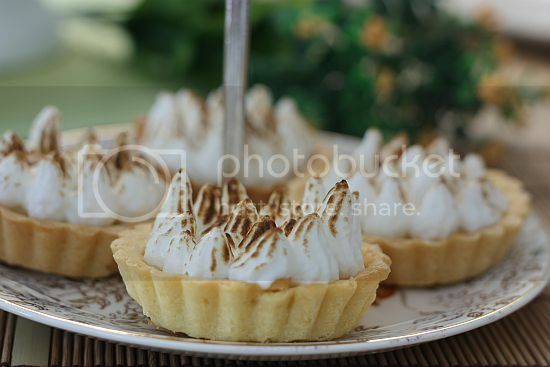 2) Spoon or pipe the meringue over the lemon curd filled pie shell. 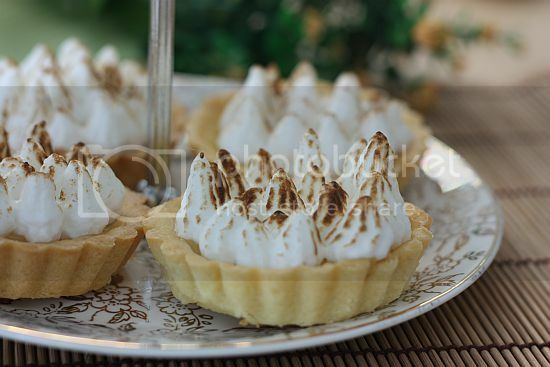 Use a hand-held blow torch to crisp up the meringue. If you don't have one, place under an oven grill but watch carefully in case the meringue burns too quickly. agree...buying a dog isn't like buying a typical pet i feel. it's like getting an additional family member, attention and care given is required. 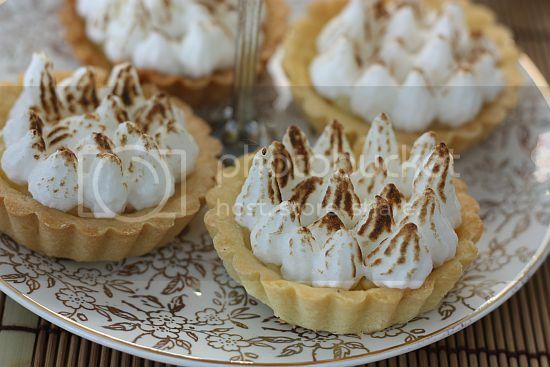 your meringue tartlets look really divine! Yup, totally agree with the dogs for life theory. I have 3 dogs (2 goldens and 1 mixed spitz)and though they drive me nuts sometimes, they are the funniest, most loyal and comforting..
Lovely tarts to go with afternoon tea! Lovely tarts! Yes dogs are lifetime commitment but it's worth it! My dogs are always my best companions and joy of my life. So so pretty! They are a classic. And I am totally with you about petting dogs (or cats). They are your family members, not the clothes you can give away if you are tired of them. I agree too.. having a dog is really a life time commitment. But they are really faithful companions ! And nice tarts there ! Making me feel hungry for a piece now ! Lovely, my mouth is watering just looking at them, I will have to now go and do some baking. Hi all, thanks for dropping by. I have some left over curd in the fridge, so don't be surprised to see a couple more recipes using the left-overs. Hi Jean, Swee San, Wen, my two are great companions and get more pampering than I do! Hmmm something is not right here?? Hi Wiffy, she's still bugging her mum and the answer is still NO! What a great way to catch up while grocery shopping! I love lemon tarts! Especially if there's a thick layer of pillowy meringue. Yum! My mom would love these! I'm not a huge fan of lemon but they sound good even to me! Beautiful! You are right, I have to think twice before posting anything on FB esp since my mum is on FB as well! 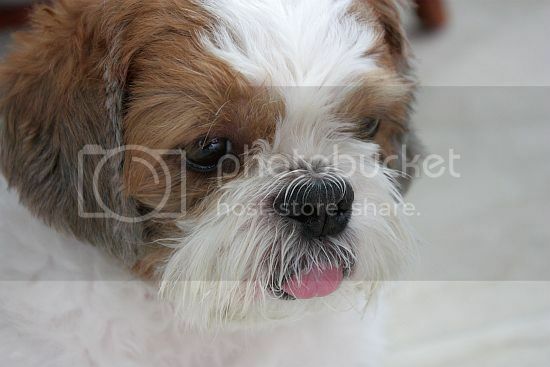 Hi Tigerfish, my elder dog is now 14 years old and prob wont have many years left. Had to face that day when it comes.